The Nimbo by Wenzelite offers the best in rehabilitation and support as a mobility aid. 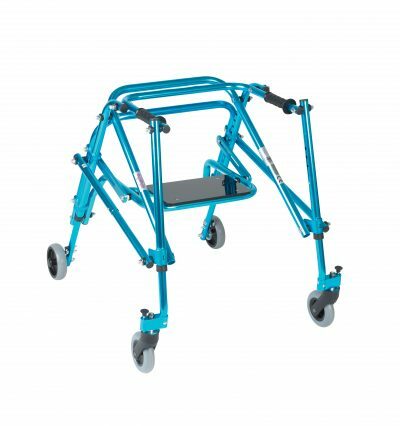 The walker is height adjustable allowing it to conform to various user sizes. The 5″ rear wheels can be set up to either move forwards only or forwards and backwards. Front wheels swivel for easy maneuverability but may also be set as fixed to prevent turning. The handgrips are latex free with flanged ends and the walker is easily foldable for convenient transporting. Also included is a seat for the Nimbo which folds up for standing and walking and flips down for convenient seating. Be the first to review “Nimbo Rehab Lightweight Posterior Posture Walker with Seat, Youth, Cornflower Blue” Click here to cancel reply.